← NACCHO Aboriginal Health News Alert : Download Progress reports : One year on from Royal Commission findings on Northern Territory child detention: what has changed? ” It is well established that Aboriginal led solutions deliver better outcomes. 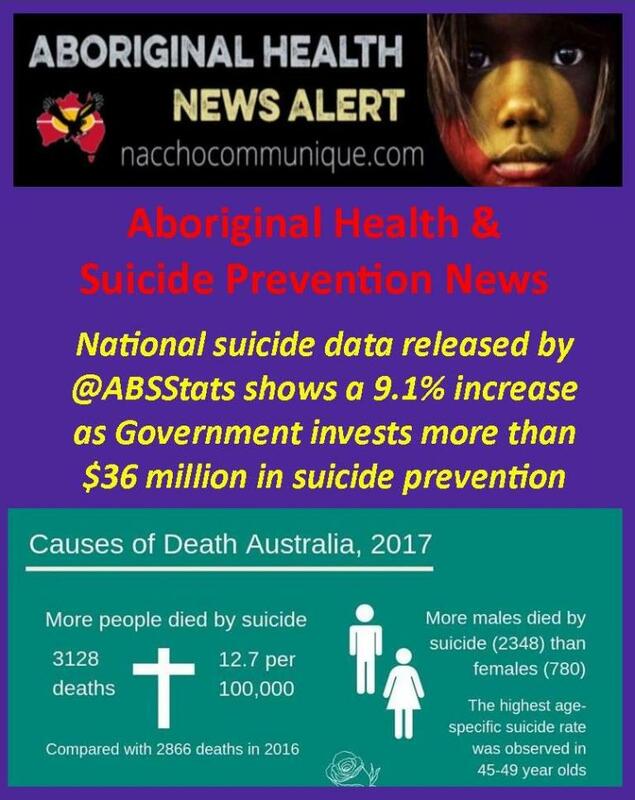 Aboriginal community-controlled health services should be funded based on need and so that they can develop comprehensive suicide prevention initiatives with the communities they service. The Aboriginal and Torres Strait Islander Suicide Prevention Evaluation Project identifies successful Indigenous community led health led responses including providing positive health messages and mental health support underpinned by a cultural framework and tackling harmful drug and alcohol use. These initiatives can be delivered by properly funded and supported Aboriginal Community Controlled Health Organisations. I also believe in regular full health checks for at risk people so that critical issues that can impact on a persons wellbeing, like poor hearing, can be picked up and addressed early. We also know that mainstream mental health service provision for Aboriginal and Torres Strait Islander people across the country is inadequate and inappropriate. Many people feel unsafe accessing the care they need. ” Suicide among Aboriginal and Torres Strait Islander communities is regularly in the media and public conversations. Often the focus is on an individual completed or attempted suicide or the negative statistics. 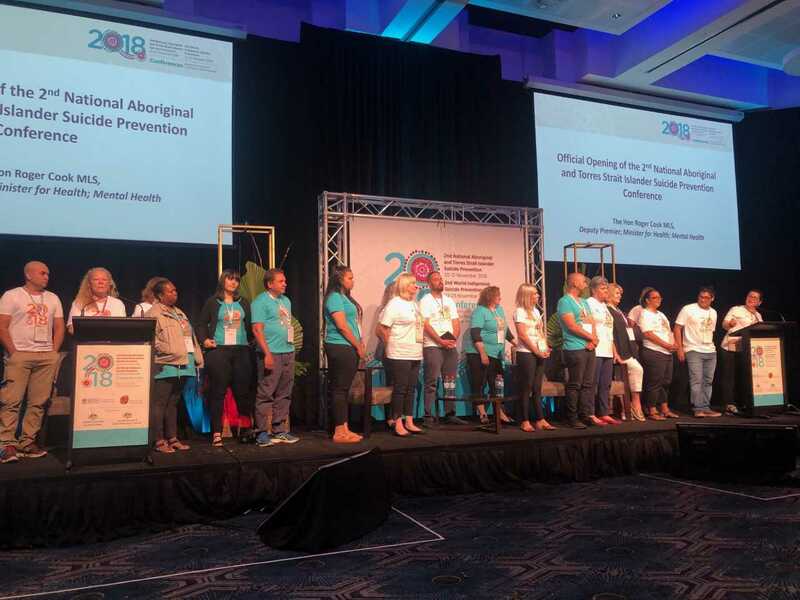 The second National Aboriginal and Torres Strait Islander Suicide Prevention Conference, to be held in Perth on November 20-21, will shift the focus to solutions identified by Indigenous people themselves. The program consists of only Indigenous people from Australia and internationally. Our voices are important because it is our mob who understand what is going on in our communities best. We live and breathe it, with many of us either having considered taking our own lives, making an attempt or having had family members who have. Our people are more than twice as likely to commit suicide than other Australians. Young Aboriginal and Torres Strait Islander men are the most at risk of suicide in Australia. Suicide and self-inflicted injuries was the greatest burden of disease for our young people in 2011. If, Western Australia’s Kimberley region was a country, it would have the worst suicide rate in the world, according to World Health Organisation statistics. Rate of suicide for Aboriginal people in the Kimberley is seven times the rest of Australia. This is not news to us: but it is unacceptable and it is why we are here today. At the heart of suicide is a sense of hopelessness and powerlessness. Our people feel this powerlessness at multiple levels, across multiple domains of our lives. It is why we have the Uluru Statement from the Heart: a cry from Aboriginal and Torres Strait Islander peoples across the nation to have a say over matters that impact on us. At the national level, it means a Voice to the Commonwealth Parliament and a full partnership between Indigenous people and governments on the Closing the Gap Refresh with COAG. At the regional level, it is about the formation of partnerships – like in the Kimberley one on suicide prevention – working together and advocating as a region. At the local level, it is about Aboriginal people being in control of the design and delivery of programs to their own people. The importance of Aboriginal control or Indigenous led is highlighted consistently as a way to achieve better outcomes for our people. This is also reinforced at the Kimberley Roundtable and in the Aboriginal and Torres Strait Islander Suicide Prevention Evaluation Project. Community-led actions are the most effective suicide prevention measure for our people. This fundamental point cannot be ignored if the situation is to change. Aboriginal suicide rates have been accelerating since 1980. Aboriginal people did not have a word for “suicide” before colonisation. To go forward, we must go back and identify and draw on those aspects of our culture that gives us strength and identity. We also must heal by acknowledging and addressing the effects of intergenerational trauma. Part of healing must include challenging the continuing impacts of colonisation on Indigenous peoples’ contemporary lives. Aboriginal and Torres Strait Islander Suicide Prevention Evaluation Project identifies the success of Elder-driven, on-country healing for youth which has the dual effect of strengthening intergenerational ties as well as increasing cultural connection. Red Dust Healing is another example of cultural reconnection achieving positive outcomes with people at risk. The Healing Foundation also achieves similar outcomes with the same principles of empowerment and connection to culture. Almost all Aboriginal people who commit suicide are living below the poverty line. Aboriginal people who have been incarcerated and come out of prison with little to no hope on the horizon. Aboriginal people who are homeless. Aboriginal people who have been recently evicted from their public housing rentals. Aboriginal people who are exposed to violence and alcohol misuse and suffer domestic abuse. Aboriginal people who have multiple underlying health and metal health issues. Aboriginal people who are young; males; and those who live in remote areas. This tells us that we need a comprehensive public policy response to address suicide rates in our people – that suicide in our people is linked to our status and situation more broadly in Australia. It is therefore unacceptable that the National Partnership Agreement on Remote Indigenous Housing has been allowed to lapse and no further investment has been agreed. We must overturn and replace the Community Development Program that is leaving our young people completely disengaged. We must also tackle the issues that lead to the greater incarceration of our peoples, with greater investment in ear health programs, employment and education. It is why we must join the call for Newstart to be raised, so that our people who cannot find work, are not living in poverty. And it is why myself and NACCHO are working with Aboriginal and Torres Strait Islander peak bodies across Australia to ask COAG for a seat at the table on the Closing the Gap Refresh: so that we get that policy right. Whilst these matters can be overlooked in our efforts to respond to suicide in our people, and because it is difficult for governments, but they are fundamental drivers. 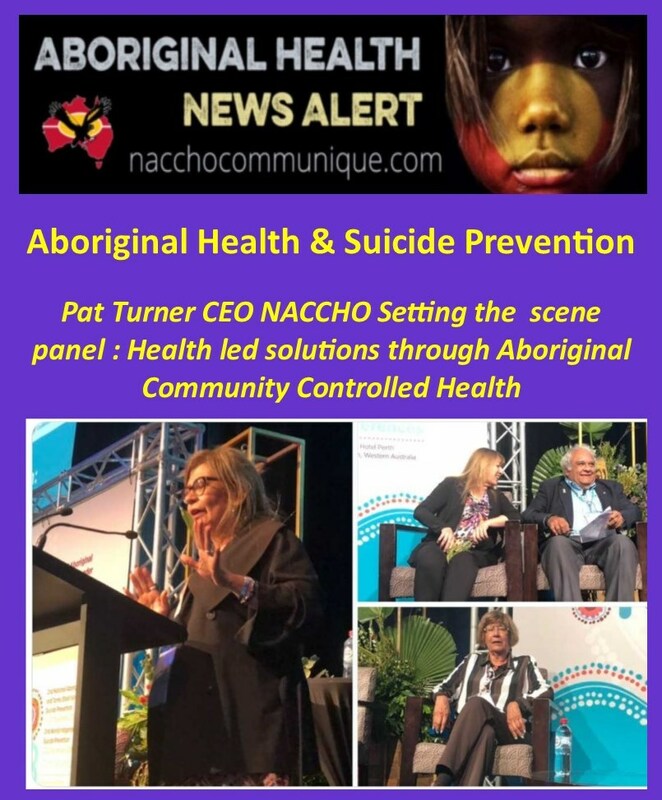 The second National Aboriginal and Torres Strait Islander Suicide Prevention Conference will take place in Perth this week. Summer May Finlay, who will cover the discussions for the Croakey Conference News Servicetogether with Marie McInerney, writes below that the focus will be on community-based solutions, as well as listening to young people and LGBTIQ+ sistergirls and brotherboys. For news from the conference on Twitter, follow #ATSISPC18, @SummerMayFinlay, @mariemcinerney and @CroakeyNews. Suicide among Aboriginal and Torres Strait Islander communities is regularly in the media and public conversations. Often the focus is on an individual completed or attempted suicide or the negative statistics. Our voices are important because it is our mob who understand what is going on in our communities best. We live and breathe it, with many of us either having considered taking our own lives, making an attempt or having had family members who have. This is why the program includes a focus on community-based solutions. While the term “Aboriginal and Torres Strait Islander” is used as a collective term for the Indigenous nations in Australia, each community within each nation is unique – culturally, socially and historically. This means that solutions need to be tailored to each community. Again, this focus is reflected in the conference program. That’s not to say everyone in each community has the same needs and concerns. Within communities there are sub-groups who also have distinct needs, such as young people and LGBTQI+ sister girls and brother boys. Our young people and community of LGBTIQ+ sistergirls and brotherboys experience disproportionate rates of suicide. Their voices on how to address the situation are important to hear, which is why these groups are well represented at the conference, with sessions where people will share their stories of ways forward. Dion Tatow, a conference presenter, says the focus needs to be on ways forward because being “LGBTIQ+ sistergirls and brotherboys isn’t the cause of suicide, it is the discrimination and exclusion that are the cause”. Tatow is an Iman and Wadja man from Central Queensland and South Sea Islander (Ambrym Island, Vanuatu) and chairperson of gar’ban’djee’lum, a Brisbane-based, independent, social and support network for Aboriginal & Torres Strait Islander people with diverse genders, bodies, sexualities and relationships. 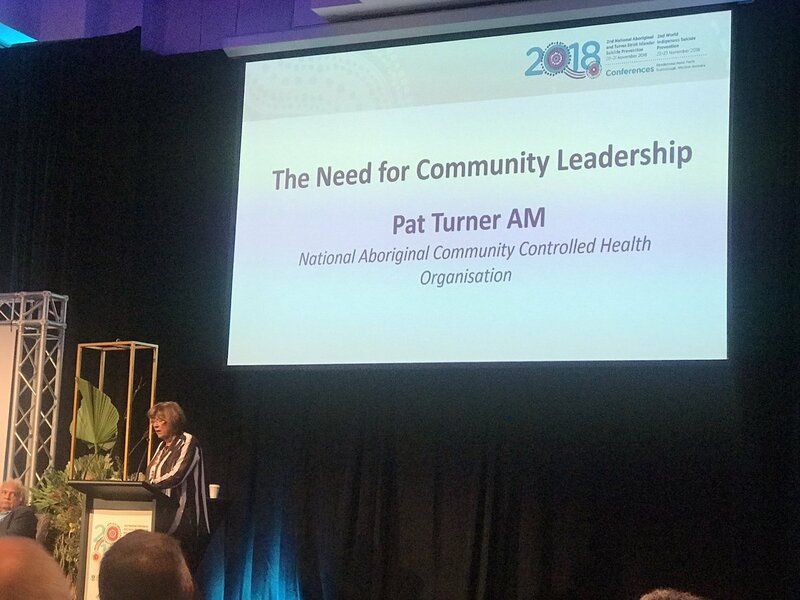 He believes that Aboriginal and Torres Strait Islander people and organisations like Aboriginal Community Controlled Health Organisations (ACCHOs) and cisgender people and mainstream organisations have a role to play in improving the health and wellbeing of LGBTIQ+ sistergirls and brotherboys. However, many health services “staff aren’t trained to deal with some LGBTIQ+ sistergirls and brotherboys’ health concerns such as gender reassignment.” This can mean LGBTIQ+ sistergirls and brotherboys can feel uncomfortable accessing a service. Tatow believes that ACCHOs need to step up and become “safe spaces” for LGBTIQ+ sister girls and brother boys. He says that there is a perception among LGBTIQ+ sistergirls and brotherboys that ACCHOs may be unsafe, with concerns particularly around confidentiality. According to Tatow, the program Safe and Deadly Spaces run by Aboriginal and Torres Strait Islander Community Health Service in Brisbane (ATSICHS) is a great example of what ACCHOs can do to offer appropriate services to LGBTIQ+ sister girls and brother boys. ATSICHS is “committed to being inclusive of all sexual orientations, gender identities and intersex variations to ensure every member our community feels safe, accepted and valued when they access our services and programs”. Young Aboriginal and Torres Strait islander people also have a strong presence at the conference. Culture is Life, led by the Chief Executive Officer Belinda Duarte, has taken charge of the youth program. 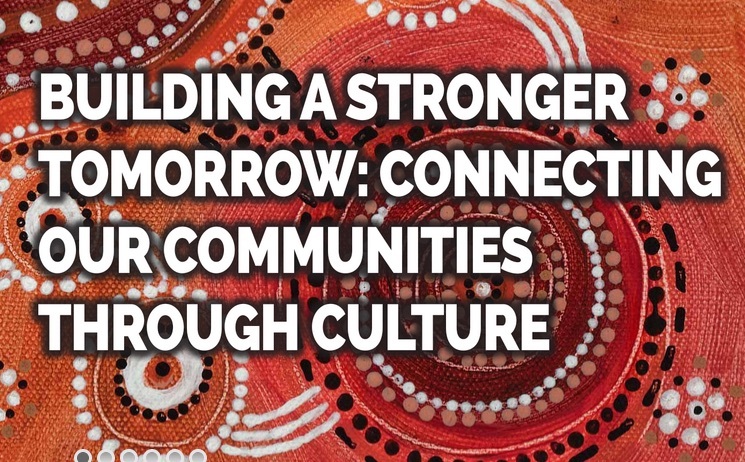 Culture is Life backs Aboriginal-led solutions that deepen connection and belonging to culture and country, and supports young Aboriginal and Torres Strait Islander people to thrive. This includes allowing young Aboriginal and Torres Strait Islander people to take on leadership roles. Modern culture is marching down the street and finding the balances in different ways such as art, dance and contemporary dance, poems, song writing, music. Katie Symes, Culture is Life General Manager – Marketing and Communications, also believes Culture is a key “protective factor” for Aboriginal and Torres Strait Islander young people. Will Austin and Katie Symes encourage young people at the conference to have their voices heard. And the conference is designed to be just that, a safe space. Culture is Life is promoting the importance of “Listening with our hearts to the lived experiences of First Nations young people, their friends, families and communities” through its LOVE and HOPE campaign, which aims to aims to raise awareness through communicating the evidence, lived experiences and Aboriginal-led solutions. This aim is echoed through the conference. You can watch the two campaign videos featuring young Aboriginal and Torres Strait Islander people and Professor Pat Dudgeon, chair of the conference organising committee, here and here. Also follow the campaign on social media using the hashtags #loveandhope #culturesquad #cultureislife. The conference showcases evidence from research and lived experience from Aboriginal and Torres Strait Islander people and Indigenous brother and sisters from other countries. The uniqueness of the program will lend itself to a unique experience for attendees. This conference follows the first conference held in Alice Springs in 2016 as part of the Aboriginal and Torres Strait Islander Suicide Prevention Evaluation Project funded by the Commonwealth Government (see this Croakey report compiling coverage of the conference). • Further reading: On World Suicide Prevention Day, calls for the Federal Government to invest in Indigenous suicide prevention.